Additionally you can setup tolerance for detecting blank pages. To make sure that no important info is removed by deleting blank pages, you can set the program to save them in either PDF of Tiff format. You can experiment with tolerance and workspace with no risk of data loss. To save memory space a compression should be applied. 10 compression types are available in this Tiff splitter. If you are not sure which is suitable, the program can automatically define the best way of compression for each file part. 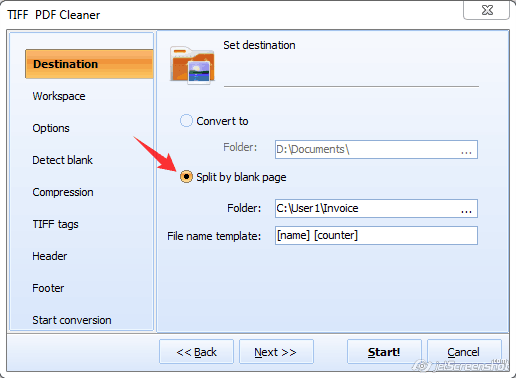 It�s easy to divide huge Tiff files to parts and clean them from empty pages with TiffPdfCleaner. Try it for free. Thanks for the update! I hope it’s free to old users. Do you provide a server version so that we could install it on our servers? What’s the price? I simply want to say that TIFF Splitter is a great program, but consider to make it less expensive (free?) to students. Thanks for sharing! What about splitting PDF files by blank pages? I ‘d appreciate this option, I do not work with TIFF files . Hello there, just became aware of your blog through Google. I tried your tool and it worked all right with the first 6 folders of my files. But then it froze and never processed the rest 2 folders. Support people asked for my files, I already sent them. Waiting for a quick solution!